After another exciting year of Massachusetts high school football, SuiteSports.com and its panel of high school correspondents are excited to announce our MIAA Football award winners. While a bevy of players stood out this season, including all who made our second annual All-State Team, these stood above the rest due to their production and value to their teams, both during the regular season and in the state tournament. This group helped their respective programs reach new heights, and excelled as individuals, on and off the field. So, at long last, here are this year’s SuiteSports MIAA Football Award Winners. Lincoln-Sudbury was ahead of schedule this year, mostly because the Warriors were able to run the ball with ruthless efficiency, while clamping down on opposing ground games. At the center of those strengths on both sides of the ball was our "SuiteSports MIAA Football Lineman of the Year Award" winner Cal Kenney, a 6-foot-3, 265 lb. junior who helped carry L-S all the way to Gillette Stadium. Defensively, Kenney's massive size and absurd strength made him virtually immovable against the run as a nose guard, but often overlooked was the junior's quick feet and highly dangerous inside spin move, which proved to be lethal for opposing quarterbacks and interior linemen. Offensively, it was much of the same, as Kenney served as a brutal in-line blocker for the Warriors, but also showcased the athleticism and effort it takes to be a great pulling guard, often getting to the second level on the perimeter to spring a game-changing run. Despite a heart-breaking loss in the Division 2 Super Bowl to King Philip, Lincoln-Sudbury returns a loaded rising senior class that, led by Kenney, will be hungry to bring a state title back to the 'Bury in 2018. SuiteSports.com and its panel of high school correspondents are pleased to announce today that Melrose standout junior Isaac Seide is the recipient of our first annual “SuiteSports MIAA Football Breakout Player of the Year Award." Seide took over a majority of the workload after Red Raiders running back Rey Guity went down with an injury towards the end of the season, but seemed to only increase his production come tournament time. Seide's value to Melrose was never more evident than in the state championship, when he ran for 184 yards and two touchdowns in the Red Raiders' 21-0 win over Nashoba. Over the final four games of the Red Raiders' season, Seide rushed for 723 yards and 11 touchdowns to lift Melrose to their first Super Bowl in school history. After taking the state by storm late this season, we at SuiteSports are excited to see what Seide can produce as a senior starter in 2018. Call it a "lifetime achievement award" if you like, but when legendary Everett coach John DiBiaso announced he was stepping down as leader of the Crimson Tide football team this week, it made our second annual "SuiteSports MIAA Football Coach of the Year Award" decision a whole lot easier. DiBiaso is, quite simply, a giant in Massachusetts high school sports, and has presided over some of the greatest football teams, players and dynasties in Bay State history. This year's Everett group will certainly be viewed favorably by local sports fans for years to come, as the Tide's explosive offense and fast, aggressive defense overwhelmed every team Everett faced. At the center of it all was Dibs, the architect who turned a group of gifted receivers into one of the most unstoppable in Massachusetts history, and who helped develop junior quarterback Jake Willcox into an instant star in his first full season under center. While reigning Coach of the Year Brian Lee led King Philip to another state title, long-time Lincoln-Sudbury coach Tom Lopez brought his group along far quicker than anybody thought, and John Andreoli turned St. John's (Shrewsbury) into a points scoring machine this season, our coach of the year is Dibs. When you build one of the most consistent winners in all of high school football, and go out on top with one of your most dominant teams ever, could we really pick anyone else? SuiteSports.com and its panel of high school correspondents are pleased to announce today that Bridgewater-Raynham linebacker Bryce Shaw is the recipient of our second annual “SuiteSports MIAA Football Defensive Player of the Year Award." Shaw was the face of a Trojans defensive unit that was stellar en route to the Division 2 South Sectional Final. While also excelling on the offensive side of the ball, Shaw made his name at linebacker, terrifying opponents with his ability to break through the offensive line for tackles against the run, and as a terrific coverage 'backer. Basically, Shaw was the most complete linebacker in the state, and the unquestioned leader of one of the Commonwealth's finest defenses. On the year, Shaw finished with 132 tackles (12 per game), 10 tackles for a loss and a pick-six. That pick six went for 69-yards, sealing a 40-26 Trojans win over Barnstable in Week five. Shaw will continue his playing career at The Naval Academy in Annapolis next fall. SuiteSports.com and its panel of high school correspondents are pleased to announce today that St. John’s (Shrewsbury) quarterback Steve Bucciaglia is the recipient of our second annual “SuiteSports MIAA Football Offensive Player of the Year Award." There are very few in the history of Massachusetts high school football that have put up the kind of single season numbers that Bucciaglia did in 2017. Stewarding one of the top offenses in state history, Bucciagllia piled up 3,601 passing yards, threw 45 touchdowns, and finished with just one interception. The versatile senior added 305 yards and six scores on the ground. The 3,601 passing yards rank first in Central Massachusetts’ single-season history, while his 45 touchdowns also set a CMass record, and rank second all-time in Massachusetts single-season history. Bucciaglia's ridiculous 72 percent completion percentage also set a record for Central Massachusetts passers. A terrific offensive line supported Bucciaglia, as the quarterback was sacked less than five teams on the year, and a fantastic group of weapons made sure the accurate senior always had somewhere to go with the ball. But, make no mistake about it, this St. John's offense would not have been the same without Bucciaglia pulling the trigger, and the Pioneer signal caller will rightly go down as one of the best in Massachusetts history after leading his team to a Division 3 state championship. As a whole, St. John’s (Shrewsbury) set a Central Massachusetts record with 588 points en route to that state title, becoming the only team outside of Eastern Mass to win a state crown this year. 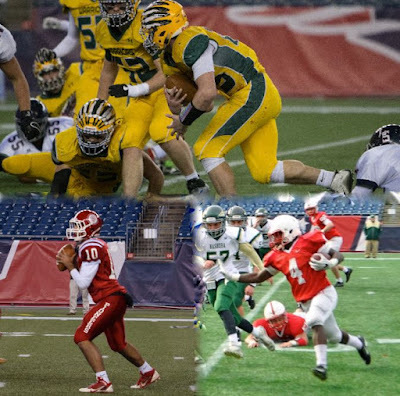 Suite Sports.com and its panel of high school correspondents are pleased to announce today that King Philip running back and linebacker Shane Frommer is the recipient of our second annual “SuiteSports MIAA Football Player of the Year Award." Frommer was chosen from a list of candidates who stood out both during the regular season and state tournament. All season long there, was no one more valuable in Massachusetts than King Philip’s two-way star. Frommer was the heart and soul of a relentless Warriors team that never shied away from the game’s most crucial moments. Frommer joins 2016 "SuiteSports MIAA Football Player of the Year Award" winner Bobby Maimaron as early winners of our most prestigious gridiron award. The face of the Warriors' 25-game winning streak, Frommer consistently came through with game-changing plays that propelled the Warriors to victory. In week four, it was Frommer’s 96-yard pick-six that helped spark a comeback against Mansfield. Then, in the Sectional Final versus Bridgewater-Raynham, it was his game-sealing touchdown with less than two minutes to play. On the season, Frommer finished with 1,537 rushing yards and 17 touchdowns, but it was in the postseason where Frommer was at his best. The determined senior ran for 646 yards and eight touchdowns over four playoff games, and helped bring the Warriors back to Gillette Stadium. King Philip offensive coordinator John Sarianides praised Frommer for his off the field commitment. Frommer’s performance in the Super Bowl was the perfect display of his devotion to the Warriors' program. Battling a hip pointer and a severe ankle sprain, Frommer ran for 137 yards, a game-tying touchdown, and rushed five times on the Warriors' final drive to set up Cole Baker's 30-yard game-winning field. The two-time Super Bowl champion will continue his playing career at defending Ivy League champion Yale next fall, and finishes his senior season as our top player in Massachusetts.